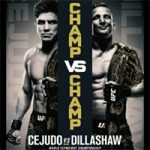 The Ultimate Fighting Championship came to Barclays Center in Brooklyn, New York tonight for UFC Fight Night 143: “Cejudo vs Dillashaw.” The event was headlined by a UFC Flyweight Championship bout between Henry “The Messenger” Cejudo and current bantamweight titleholder T.J. Dillashaw. In the heavyweight co-main event, controversial signee Greg Hardy made his Octagon debut against Allen “Pretty Boy” Crowder. Gregor “The Gift” Gillespie squared off with Yancy “The Kid” Medeiros in featured lightweight action. MMARising.com has live play-by-play for tonight’s main card. Cejudo landed two head kicks in the early goings and he dropped Dillashaw with a right hook to the temple. Dillashaw rose to his knees and ate more left and right hands from Cejudo. Dillashaw tried once more to stand up and Cejudo floored him again with a final barrage of punches that finished the fight. Winner: Henry Cejudo by TKO (Punches) at 0:32 of round one. He improves to 14-2-0 and remains the UFC Flyweight Champion. Power punches were exchanged right away and both men landed. Hardy backed Crowder up against the cage with right hands and Crowder countered with a clinch. He was unable to get Hardy down and Hardy scored with single punches. Crowder caught a knee and took Hardy down against the base of the cage. Hardy briefly stood and Crowder took him down again. He moved to side control and then to a top-side crucifix. Crowder struck from the top with elbows and Hardy kicked off of the cage to escape. The fighters stood and Crowder jumped into a guillotine choke, but he lost it and Hardy wound up on top. Crowder postured for an armbar and a triangle choke, which he used to initiate a scramble. The fight returned to the feet shortly before the bell. Close back-and-forth round. 10-9 Crowder. The pace slowed in the second round and the fighters traded slow punches. Crowder suddenly began taunting Hardy and he landed some decent punches before shooting in for a takedown. Hardy sprawled in defence and landed a blatantly illegal knee to the face of Crowder, which forced referee Dan Miragliotta to pause the fight. Crowder was clearly hurt by the illegal strike and Hardy was rightfully disqualified. Winner: Allen Crowder by DQ (Illegal Knee) at 2:28 of round two. He improves to 10-3-0. Gillespie wasted no time in taking the fight to the ground and he secured back control in an early scramble. Medeiros tried to shrug him off, and he eventually did so by taking Gillespie’s back for a split second, but Gillespie was relentless and he kept Medeiros pinned against the base of the cage. A rolling scramble followed and Gillespie hopped on a standing Medeiros’s back. He pulled Medeiros back down to the ground and tried to set up a choke. Medeiros stood and Gillespie stayed on his back until the end of the round. 10-9 Gillespie. The second round began with Gillespie scoring another takedown into back control. Medeiros stood and was immediately suplexed back down to the mat. Gillespie ultimately passed to mount and worked for an arm-triangle choke. He postured up with punches and Medeiros rolled to his side. Gillespie took his back and spent the final minute landing punches and elbows to the side of Medeiros’s head while hunting for a rear-naked choke. A final salvo of elbows and punches prompted the referee to stop the fight just before the bell. Winner: Gregor Gillespie by TKO (Elbows & Punches) at 4:59 of round two. He improves to 13-0-0. Benavidez struck first with kick-punch combos and Ortiz countered by latching on to a leg in search of a takedown. He got the fight to the mat, but Benavidez trapped him in a guillotine choke and Ortiz returned to his feet after breaking free. Benavidez took him down soon after, but Ortiz scrambled well and rose to his feet again. After an exchange of strikes, Ortiz landed a head kick and Benavidez floored him with a counter left hand. Ortiz recovered on the ground and Benavidez took his back before time expired. 10-9 Benavidez. Ortiz fought off a Benavidez takedown attempt with a front choke in the second round and the fighters returned to their feet. Benavidez landed a leg kick and Ortiz responded with a right hand. Benavidez caught a body kick and pressed Ortiz up against the fence. Ortiz defended with short punches and prevented Benavidez from taking his back after the fight briefly hit the mat. Ortiz reversed a takedown and landed on top. He transitioned to a partial Twister position, but Benavidez escaped and that led to a scramble on the ground. The fighters stood and both men landed hard punches. Ortiz ate a big right hand and secured a crucial takedown into back control. He tried for a rear-naked choke and Benavidez defended. 10-9 Ortiz. The final round began with Ortiz landing a combination, which was answered by a takedown from Benavidez. Ortiz threw elbows to the spine and was warned for the infraction. Seconds later, Benavidez took his back, but Ortiz reversed and wound up on Benavidez’s back. Benavidez shrugged him off and struck from top position with punches. He took Ortiz’s back once more and Ortiz threw reverse elbow strikes in defence. Benavidez hunted for a rear-naked choke and kept Ortiz trapped in a body triangle. Ortiz briefly freed himself, but Benavidez dragged him back down again. The fighters battled for position on the mat and eventually stood up against the cage. Both men repeatedly gave up their backs in the grappling exchanges that followed and Ortiz landed knees to the body. 10-9 Benavidez. Winner: Joseph Benavidez by Unanimous Decision (29-28, 29-28, 29-28) after three rounds. He improves to 27-5-0. Ostovich secured an early takedown into VanZant’s guard and she put pressure on VanZant’s throat with her shoulder as VanZant tied her up from the bottom. The referee stood the fighters up and Ostovich landed a looping overhand right. She tripped VanZant and worked for a guillotine choke from the top in VanZant’s half-guard. VanZant eventually broke free, but Ostovich landed punches and elbows until VanZant attacked with a kneebar attempt. Ostovich rolled through and escaped, and she threatened with an armbar at the bell. 10-9 Ostovich. VanZant opened round two with leg and body kicks, which were answered by a right hand from Ostovich. VanZant threw a Superman Punch and Ostovich took her down into side control. She hopped on VanZant’s back in search of a rear-naked choke, but VanZant shrugged her off and secured back control herself. She punished Ostovich with punches while flattening her out and Ostovich tried to escape out the back. VanZant extended Ostovich’s left arm in an armbar and a dejected Ostovich was forced to submit. Winner: Paige VanZant by Submission (Armbar) at 1:50 of round two. She improves to 8-4-0. Teixeira shot in for an early takedown against the cage, but Roberson badly hurt him with elbows to the temples and Teixeira fell to his back. Roberson mounted him and trapped his left arm while landing punches to the face, but Teixeira managed to scramble free and he stood up. Roberson landed more elbows, but Teixeira weathered the storm and took Roberson down into mount. He struck from the top until Roberson regained full guard. Teixeira then transitioned to a tight arm-triangle choke from side control and Roberson hastily tapped out. Winner: Glover Teixeira by Submission (Arm-Triangle Choke) at 3:21 of round one. He improves to 28-7-0.